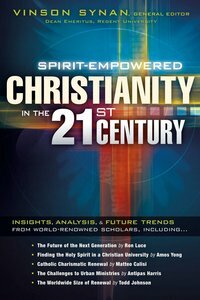 Spirit-Empowered Christianity in the 21st Centuryis an authoritative compilation of the presentations from thirty leaders in the Charismatic/Pentecostal movement given at the Empowered 21 Conference in Tulsa, OK, in April 2010. These chapters share emerging insights on how the next generation will handle the profound issues facing Christians within the Charismatic/Pentecostal movement in the 21st century. For example, one portion covers the topic of the 21st century renewal while another discusses how we can protect our Charismatic distinctive. Another portion will highlight Charismatic adaptations for reaching this present age, discussing issues of social and economic justice, prosperity and suffering, challenges to urban ministry, the future of the next generation, Oneness Pentecostalism, and missiological aims in North America. About "Spirit-Empowered Christianity in the 21St Century"